Over the course of my life I’ve noticed I have moments when I can’t get a complete breath, or cycle of a yawn. The sensation of a heaviness sitting on my chest, it happens in times when I seem stressed and unable to keep focused. Ironic! This recently came up as I’ve been doing some Energy Work and working on my past by delving into areas to heal. So, I realize many of us don’t take time to tune into our breath as we move throughout our daily life but it is what keeps us alive ~ it is the LIFE FORCE! If you’re one who actively meditates, does yoga, runs, or does any sort of exercise activity, you’ve probably noticed how important it is to pace your breath in order to continue with your activity. Well, it’s just as important in all of our daily activities. As an avid yogini, student and teacher, my focus during a practice is to move with the breath. Just as when I meditate, it’s about tuning-in, connecting with the breath and going within. But, this doesn’t always seem to continue outside of the studio. I see how far I’ve evolved to being more patient and kinder to myself and I also recognize this is a constant awareness we need to tap into. I no longer choose to allow things that once upset me to steal my breath, energy, or focus. I do admit it took a lot of attention to the breath, personal curiosity, a desire to change my life, research and reading, speaking with others, and becoming more aware of old thought and behavioral patterns. All of this required taking personal responsibility and acknowledging what I was manifesting in my life! It is a lot of work but more importantly, I believe if you can start by becoming more aware of your breath, you will eventually start to recognize your thought patterns, which distract from slow, steady breathing. If the breath flows smoothly, so does everything else in life! Do you have trouble breathing or breathing problems? Do you pay attention to when you are holding your breath? Do you see the root cause of this? Do you have trust in your own judgement? When you’re in a moment of crisis or stress, do you have a fight or flight reaction? Do you allow yourself to step back and take a deep breath before you evaluate the situation or do you pounce on it with impervious fervor? What really gets under your skin and why do you let it steal your breath, energy, attention? When do you find yourself the most calm breathing in and out long, steady, and controlled breaths? Do you see how you may be able to be more focused? 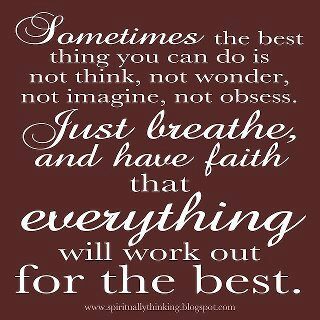 Do you have faith that everything will work out in the end? 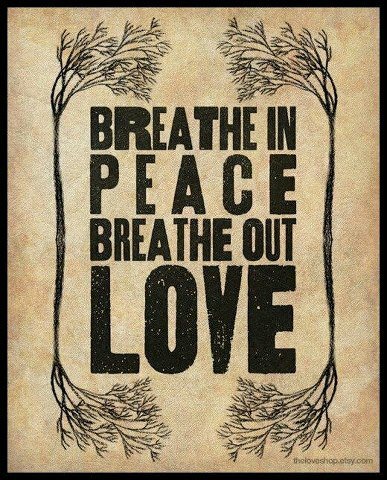 When it all comes down to it, the breath is your life force and without it, you cannot live. How your breath moves in and through your body is a directly reflected in your life. How does your life flow – like mud, a rambling brook, or a smooth flowing river? Look at how your life is and then key into if you’re actually breathing through it! Are you engaged or are you going through habitual motions? Tune-in, become aware of your inner world and how it’s reflected in the breath. I wish you happy days filled with joy, laughter, & deep belly breathing! Choose wisely where you place your attention/focus because your energy is precious and shouldn’t be wasted!